Spray a broiler-safe baking dish with non-stick spray. Make sure shrimp are completely dry and season liberally with salt and pepper then add to the dish, laying them flat and in a single layer. 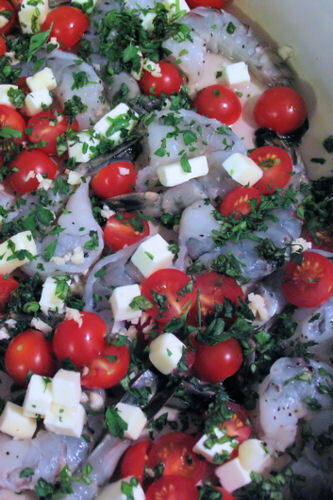 Scatter tomatoes, butter chunks, garlic and some parsley and basil (reserving some for garnish); add wine. 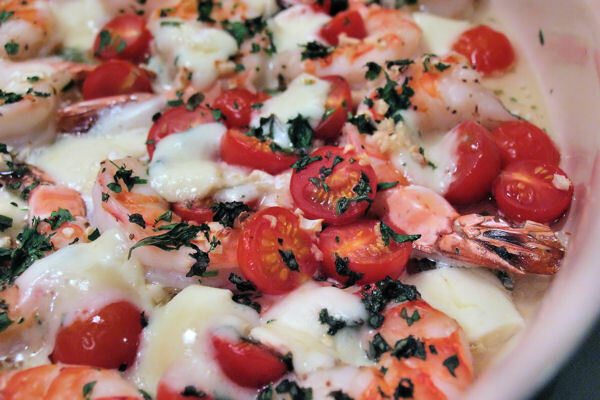 Place dish directly under the broiler and broil for 4 to 5 minutes, or until shrimp appear to be pink in color. Remove dish from oven and sprinkle cheese chunks over top. Place back in the oven and broil for an additional 1 to 2 minutes, or until cheese is bubbly and slightly golden. 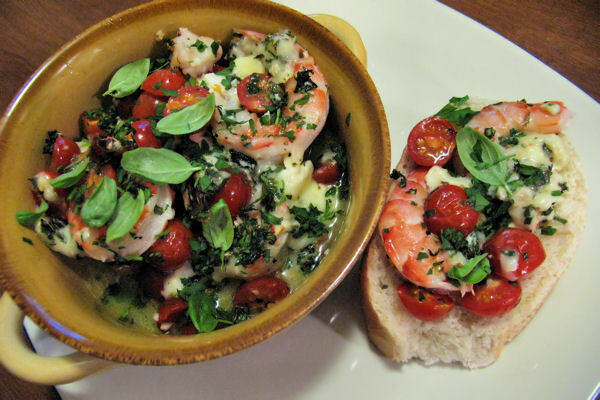 Remove from oven and let cool, then sprinkle additional basil and fresh parsley on top. Serve while still warm with crusty bread for dipping. 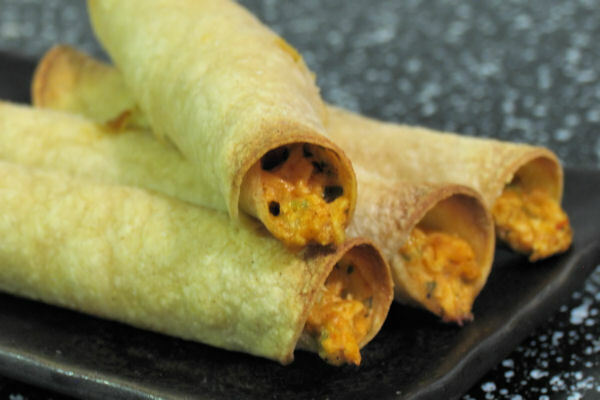 One of the dishes I was most excited to try were these chicken taquitos. Again, I’m behind the trend since bloggers have been posting about these bad boys for months now. But I am so glad I got around to trying them. They were phenomenal. And it’s so fun to make them! Taquitos are something I never thought to make. I buy them frozen when I feel like splurging on some really unhealthy food, and never thought twice about it. Not only are these baked, which makes them way more healthy than their fried counterparts, but you get the hands on experience of really working with your food. The filling can be made in advance and left in the frig. I made my filling a few days ago on one of my days off, and just now rolled them tonight. Which, by the way, is also really easy. 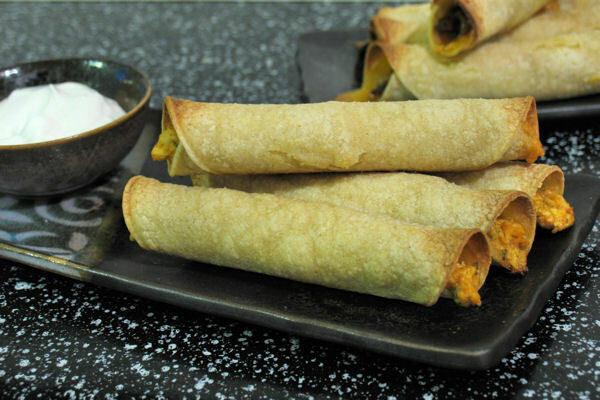 You can even freeze them so you always have some homemade taquitos on hand. 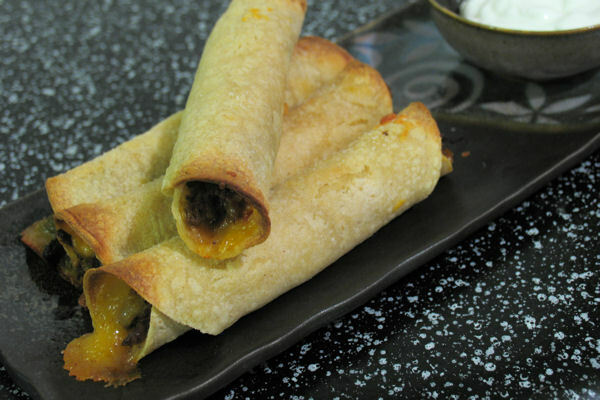 So if this is the first time you’re seeing this recipe or you’ve seen it before and just haven’t tried it yet, please try these taquitos. You will love them! Preheat oven to 425 degrees F. Lightly coat a baking sheet with cooking spray. In a medium mixing bowl, combine cream cheese, salsa, lime juice, cumin, chili powder, onion powder, granulated garlic, cilantro, and green onions. Add chicken and cheese, mixing until thoroughly combined. Working with a few tortillas at a time, place the tortillas between damp paper towels and microwave for about 20-30 seconds or until they are soft enough to roll without cracking. Place 2-3 tablespoons of chicken mixture on the lower third of a tortilla. Roll the tortilla tightly around the filling, then place seam side down on the baking sheet. Repeat the process until all the filling is used up, spacing the taquitos evenly on the baking sheet so they are not touching each other. Spray the tops lightly with cooking spray and sprinkle some kosher salt on top. Bake for 15-20 minutes or until crisp and the ends start to get golden brown. 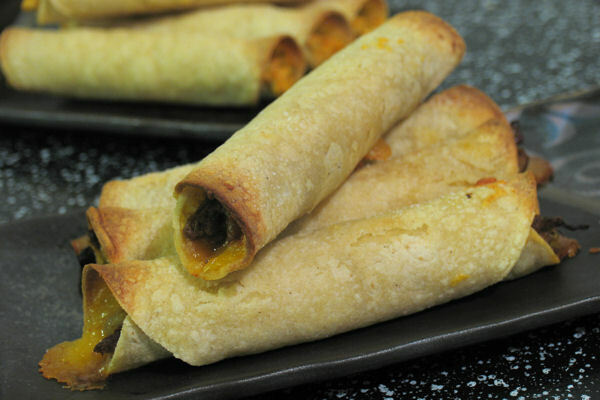 If baking frozen taquitos, add a few extra minutes in the oven. Serve with sour cream, salsa, or guacamole. There are many times that I wish I lived in a house, instead of in an apartment. One of those main reasons is a garden. I’m super envious of all the people who end up with a surplus of tomatoes and zucchini, or a backyard full of plump, juicy fruit hanging from their trees. A girl can dream, but in the meantime, I’m stuck relying on the supermarket. Preheat oven to 425 degrees F. Coat a large baking sheet with cooking spray. Cut off the ends of the zucchini, then cut in half crosswise and cut in half lengthwise. Cut the zucchini quarters into long strips, cutting lengthwise. Place flour into a large zip lock bag. In a shallow dish, whisk 2 eggs with 1 tablespoon water. In a second shallow bowl, combine Panko breadcrumbs, plain breadcrumbs, Parmesan cheese, oregano, garlic powder, salt, and pepper. 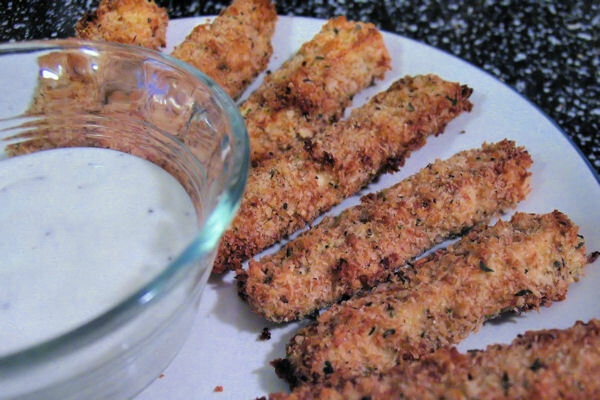 Toss the zucchini strips with the flour until well coated. Working in batches of 3 or 4 strips, remove the excess flour, dip the strips into the egg mixture, then into the breadcrumb mixture. Toss until well coated, pressing the breadcrumbs onto the sticks to help them adhere. 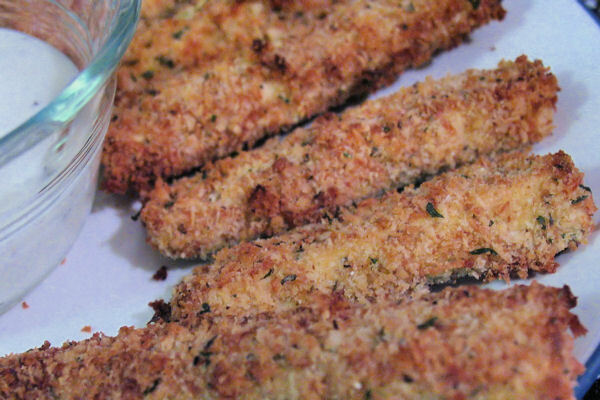 Place breaded zucchini sticks on the prepared baking sheet. Lightly spray the zucchini sticks with cooking spray, to help them brown. Bake for 15-20 minutes, or until golden brown. Serve immediately with Ranch dressing or marinara sauce for dipping.